I’ve been thinking about these guys a lot since they’re coming to St. Paul this Thursday (March 24, 2011). 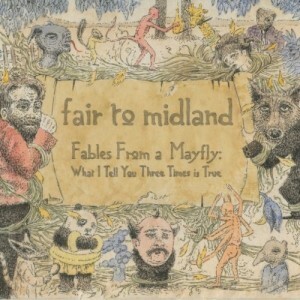 Ever-cryptic Fair to Midland is a fascinating and talented alternative metal band from Texas, one of the best of young indie acts I’ve heard. What makes them so good? Well, to begin with, they have that Prog-Metal-for-ADD frantic changes going on, that System of a Down pioneered. Their songs are concise and focused yet you just never know where it’s going to go next. One moment head-crushingly heavy and the next moment tenderly melodic, you’ll never be bored listening to this album. And the quality of songwriting is consistently high, that I can listen to the whole album for one uninterrupted, satisfying experience. Then there’s that whole Medieval vibe they incorporate into music — from the cover graphic to lyrics to harpsichord-like sounds coming to you courtesy of Matt Langley, their keyboardist. Indeed, Langley is perhaps the not-so-secret weapon of this band that really make them stand apart from other brutes. Intricately weaving in and out of the music, his keyboard textures and melodies really add delicate air to the pounding and the thrashing that the rhythm sections do (and the guitarist Cliff Campbell pretty much stick to rhythm duties the whole time). And the other stand-out feature is the vocalist Darroh Sudderth. Man, what a voice, what a range. His vocal character transforms itself just as fast and often as their riffs do, from whisper-intimate to strastospherically high. This man really knows how to take advantage of dynamics and contrast, and listening to him is a truly awe-inspiring experience. Lyrically, they are just as fascinating, though head-scratchingly cryptic at the same time. The words demonstrate a lot of intelligence and creativity, strung together with a sense of logic that is just on the edge of intelligible — really, borderilne nonsensical — and absolutely no clichés in sight. But here’s where I have my sole complaint: these little poems are so out there that I can’t figure out even what, if any, are the central feelings. The songs don’t come across as unfocused (which is a feat, considering how left-field these phrases are) and there’s a logic behind the lines that is so advanced that it baffles the reader, bordering on inapproachable. On this level, their on the par with some of Tori Amos’ work — she and Sudderth (I’m assuming he wrote the words) are so smart, so gifted, that when they choose to remain high up on their cloud all we can do is just gaze up at them with wonder, but not quite connecting. I keep longing for one line in the chorus to tell me clearly the emotion that’s conveyed in these songs, because therein lies the difference between these guys and major acts like SOAD and Tool — the latter, even if you don’t know what they’re talking about, you know clearly what they’re feeling. With Fair to Midland, I can’t tell what they’re feeling. So while I’m very fascinated on an intellectual level, their songs don’t quite put me in any certain mood, thus missing an emotional connection. Anyway, to put it blatantly, these guys totally RULE and if you like some thoughts to go with your metal, they must be heard to be believed. Can’t wait to see them live.